Aroostook County - Bob Chavez of Presque Isle knows firsthand the quality workmanship that goes into the Sinawik houses built each year by students in the construction trade programs at Northern Maine Community College. As a student in the College’s residential construction program in the mid-1990’s, he worked on building two of the homes under the unique partnership project between NMCC and the Presque Isle Kiwanis Club. Fast forward 13 years and the student and builder has become the customer and soon to be new homeowner of Sinawik House number 33. Work on the 1,300 square foot modular ranch-style home is well underway in the residential construction lab at NMCC, and Chavez couldn’t be happier. He certainly attributes that high level of craftsmanship to the upwards of 75 NMCC students who each year have a hand in some part of the home construction project, but, from his personal experience, Chavez knows that the high quality is a trademark of the building trades program instructors and the work ethic they pass along to their students each year. “It’s a process and a good learning experience for the students and the home buyer as well. The instructors in each of the programs that work on the house are top notch, they do a great job working with the students to ensure the highest possible quality,” said Chavez. Work on the new homes begin each year long before a hammer ever hits a nail when Pam Buck, instructor in the computer-aided drafting program, and her students sit down with the new Sinawik (Kiwanis spelled backward) family to begin the process of making their dream reality. Once completed, usually in the early fall, plans are handed over to Guy Jackson, NMCC’s veteran residential construction instructor, so framing work on the walls, doors, windows and roof can be completed by the first-year students in the program. They then step away from the project and let students in the plumbing and heating program, instructed by Al St. Peter; the electrical construction and maintenance program, instructed by Todd Maynard; and the welding and metal fabrication program, instructed by Dennis Albert, come in to do what is referred to as the “rough-in” work. Once the plumbing and heating conduits have been installed, the wiring laid and any required ductwork is in, the structure is inspected. Then it is time for the senior residential construction students to do the finish work, which consists of installing windows, doors and cabinets and completing the interior trim. This work typically runs through the end of the academic year in May. Sinawik, a non-profit corporation, is the result of a partnership between the Presque Isle Kiwanis Club and NMCC that began in 1976. The founders of the organization wanted it to provide benefits and enrichment to both the community and College. “The Kiwanis Club of Presque Isle is very proud to be working with Northern Maine Community College once again on the 33rd annual Sinawik project. Over the years, our club has built a great rapport with members of the NMCC community. Because of the hard work and positive attitudes of NMCC's students, faculty and staff, the annual Sinawik project has become one of the premier collaborative projects in Aroostook County,” said A.J. Cloukey, president of the Kiwanis Club. Each year the Sinawik project generates five $500 scholarships for students in the various building trade programs at NMCC. The scholarships are awarded at the annual Sinawik Open House and Barbecue that is held on the last Tuesday of April each year. The event is open to the community and serves as a showcase of the latest home and the work of the students over the past year. 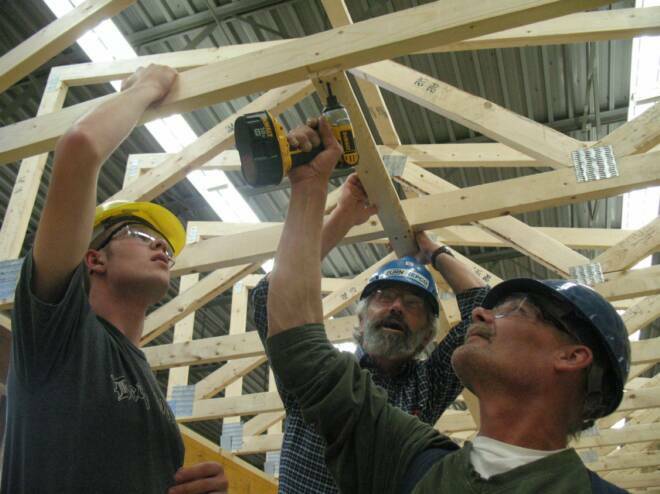 Northern Maine Community College residential construction instructor Guy Jackson (center) works with first year students John Dumond of Cyr Plantation (left) and Jon Sund of Stockholm (right) on the framing work of Sinawik house number 33 in the residential construction lab at the College.